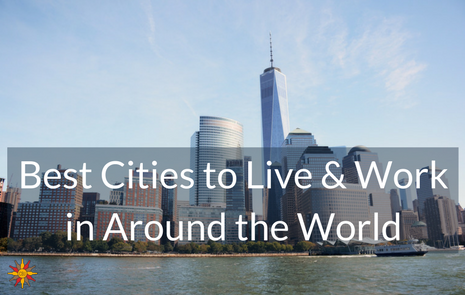 Whether you’re beginning to outgrow the place you live or you just want a change, moving to another city around the world will be one of the best experiences of your life. Exploring, making friends and maybe even learning a new language are amazing things to do at some point in your life, but where do you move? normally people move for work but if your career is stable why not apply for careers in cities you love. If you’re struggling with where to begin looking, here are 10 of the best cities to live and work in (in no particular order). A city known for its romance, Paris is an iconic city full of place to visit daily and with the beauty of it, you’ll struggle to become tired of looking at everything. Paris is also known as one of the financial sector giants, the career progression there is outstanding with plenty of different areas to specialize in. The food and drink are some of the best in the world, most cuisines from around the world are available and perfection is common in most restaurants. The only setbacks are that Paris has a high crime rate, high rents and the wages can sometimes lack in comparison to other cities on the list. The Swiss city has a natural evening glow that’s reflected in the river Limmat to illuminate the city at night, it’s breath-taking. Zurich is another big player in the financial sector, and its abundance of wealth has contributed to the city greatly. Although the average income is a lot higher in this city, jobs aren’t as readily available as other places. If the city itself isn’t enough to tempt you, remember its surrounded by countries to explore by train or car, it’s the heart of France, Germany and Italy. There isn’t a bad thing to bring up about Stockholm unless you don’t like cold weather. Stockholm is finding itself on more destination list than ever, with a low crime rate, high wages and being known for an efficient relaxed lifestyle, the city is tempting. The city is also constantly trying to better itself too, it plans to be fossil fuel free by 2050 and has one of the best environmental policies in the world. One of the fastest growing cities in the world, everything is in abundance in Dubai. Careers in the business sector are thriving and it has one of the highest average wages too. The nightlife and drinking scene in the city is world renowned and during the day seeing supercars, yachts and other luxuries doesn’t get tiresome. The main thing to consider would be the law, it’s very different to Europe and North American and some can struggle to adapt. The centre of a growing Chinese economy, Hong Kong is a concrete jungle that is unmatched in size. Career opportunities and daily life are lucrative in Hong Kong and the lifestyle itself is amazing to be part of, plus a lot of the citizens speak English to make things easier. The city itself is surrounded by attractions, mountains and the gambling capital of Asia, Macau. The humidity is the main point of consideration in Hong Kong, it usually takes about a month to acclimatise. London likely has the most history on the list, although it’s an expensive place to live, a lot of people live outside and commute in for work to keep costs down. Other than that, London is rich in career opportunities, nightlife and unrivaled culture to learn about. Every day is different in London and it’s defiantly a city that everyone should experience. With recent European change though, is worth looking into the UK visa application process to make sure it’s still a viable option. It’s hard to avoid Sydney when it comes to the lifestyle. Sydney is responsible for 7% of the country’s economy and careers are plentiful in the sunny city. It’s a multi-cultural city with some of the friendliest locals you’ll ever meet. The lifestyle is something for most to desire, relaxed jobs, pioneers in coffee and amazing nightlife will easily sway you to move to Sydney. Similar to London, New York is a world capital to experience. Any career imaginable is likely to be an option in the city that never sleeps, and there’s always somewhere new to experience whether it’s in the day or evening. Depending on the areas you look at, New York can be affordable to live in but the accommodation won’t be at the top of the list. Known for its showbiz side L.A. can offer a lot more in the career sector, but if you’re looking to work whilst becoming famous, L.A. is the top destination. Tourism, beaches and perfect weather are all in rich quantities in L.A. but be wary of the price of living there. It’s located in a perfect hub on the west coast, where Las Vegas, San Francisco and San Diego are all in travelling distance. One of the most picturesque cities in England York offers cobbled streets gothic building and a lot of English tourism. It’s a hidden gem for those unfamiliar with England but its worth at least visiting to see if you fall in love with the lifestyle. More companies are being started in the north of England so its career options are quickly growing with it. Hopefully one of these cities has inspired you to further your research or maybe even take a trip to see if you think you’ll fit in. it’s never too late to move away even if it’s just for a year to see how you take to it. Written by: Richard Meadow is a freelance writer that has spent 4 years traveling after University. He’s been all around the world and learnt a lot about different cultures compared to his home in the UK. He wants to share his knowledge with his readers in a way that they could use the information for a practical use.